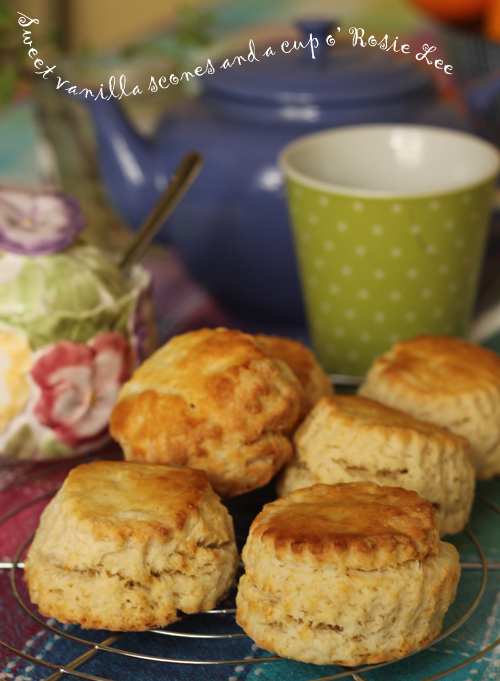 Alchemy in the Kitchen: Sweet Vanilla Scones – Worth getting out of bed for! Sweet Vanilla Scones – Worth getting out of bed for! A big jug of coffee had just been set in the hearth, the seed-cakes were gone, and the dwarves were starting on a round of buttered scones, when there came- a loud knock. In my house the loud knock came before the scones, and it wasn't a rat-tat on a Hobbit door, but my bedtime reading (Neil Jordan’s ‘Mistaken’) falling off the bed and crash-landing on the floor, which startled me out of dreamland. There was no going back to sleep and 2 doses of BBC drama and the news headlines later, I gave up and decided to have an early, early, early breakfast that was worth getting up for on a dark frosty morning. I had Sweet Vanilla Scones mixed and in the oven in the time it took to brew a proper pot of Rosie Lee under a tea cosy. I poured out the first mug of the day and curled up on the sofa to devour another chapter until my nose (and my digital timer) told me it was time to take the scones out of the oven and make another brew. Place the flour, baking powder, and salt in a mixing bowl. Add the butter and rub it into the flour mixture, lifting and crumbling the mixture between your index and middle fingers and your thumbs, until it resembles fine breadcrumbs. Stir in the sugar and add the vanilla extract to the bowl, followed by as much of the milk as is necessary to form the ingredients into a soft dough with no dry flour remaining, mixing gently all the while until you reach that point. You may not need all the milk. Turn the mixture onto a lightly floured work surface. With lightly floured hands, knead gently to form a ball. 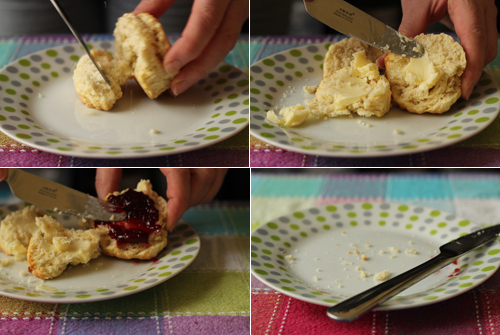 The less you mix and handle the dough, the lighter the scone. Pat the dough out into a round approximately 2cm thick – you could use a rolling pin for a more even finish. Using a 6cm (2.5”) cutter, stamp out scone shapes from the dough, re-forming any scraps into a ball and once again flattening to 2cm before cutting. This mixture yields 12 x 6cm scones. (You could make them larger or smaller if you like, adjusting the cooking time up or down accordingly). Place the prepared scones on a non-stick baking sheet and brush the tops with beaten egg or a little milk. Bake in the preheated oven for 12 – 15 minutes until risen and golden brown. When baked through, remove from the oven and place on a cooling rack for about 5 minutes before serving with butter and jam. Scones are best eaten the day they are made but generally there are no leftovers so this won’t be a cause for concern. They also freeze well. TIP: Try to stamp out as many scones as possible from the dough on the first pass as scones formed out of the scraps of dough can turn out a bit misshapen. Also, cut the scones out by pressing straight down with the cutter, avoiding the temptation to twist (unless you want scones with individual character). These look so good. How close do you place the scones on the baking tray? I think these will make my day as I try to finish the book I'm reading.